The Story within the Story | GetAlongWithGod.comGetAlongWithGod | A blog about discovering a God worth knowing. I was so deeply touched by Martha’s podcast on the homegoing of her husband, and was particularly struck by one remarkable sentence: “The end of a story IS the story.” This sentence, simple as it is, is a remarkable one because it sums up all the truth about our human lives. “The end of a story IS the story” brought me back to Carole’s vision about being in the Womb of God, and then John’s post about the ceasing hope we find in this world. For me all of this goes together. If this life is just a short time of development, why do we bother so much about it when there is a whole eternity to come behind? There is a wide range of religions in this world, which more or less despise this very life for the sake of a “higher goal”—whether it be some kind of “paradise” or a more impersonal “Nirvana.” This is NOT what Scriptures say, and this is not what I’m trying to say. On the contrary, the time spent by an infant in his mother’s womb is very important for his life! This is the time that determines their future health, their stature, their abilities… But let us keep in mind, the infant can’t do anything to affect growing in health except to receive. Within certain limits the mother can help. And beyond all limits, God certainly can! When I understand that God does not see me as the wise and capable adult I so like to pretend I am, all my strivings for achievements become rather dull. And when I see my life before the screen of a whole eternity coming behind, all my wants and needs and wishes and have-to-gets look a bit limited. I see that it might be better to simply stick to that umbilical cord and just receive. Receive what? HIMSELF! 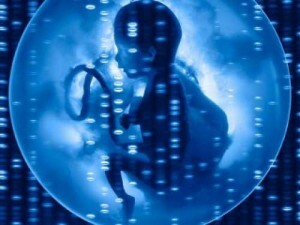 God is the womb and the cord, the food, the growth and the health. He is the Alpha and the Omega: The end of my story here and the beginning of my new one. All I can ever take to the Father at the end of my life is His Son in me. This is a beautiful thought which I write now, but how often do I live it? How often do I believe it? I mean BELIEVE it? If I did believe, really and truly all the days of my life, surrender would be as normal as breathing. I would not cling to demands, rebellion and fear. Inhale with me that truth, the biggest truth in the universe: If an Eternal God is our Life, then we are immortal. If the Maker of History is in control, then we are untouchable. The solution to all questions is called Faith, and the way there lies in deep relationship. When we know, really KNOW Him, then we have nothing to fear. Thank you Gaby, for this wonderful reminder of the unchanging realities of our life in Christ (to which sadly, we are so often oblivious). Reading your article this morning was a poignant and blessed reminder of the path to the abundant life that Jesus died to bring; but beyond that, it also brought a transformational perspective in seeing that our short lived life on this earth is but a gestational period preparing us for ruling and reigning with Christ for all of eternity! Wow, Gaby. What a blessing. That’s so filled of oil, and it is so ROCK SOLID true!